Have a Girl Scout? Are you planning a celebration for your Scout Troop? These Rainbow Girl Scout Cakes are made with a box cake mix and American buttercream icing. They are fun to make as a group. They're even more fun to eat! 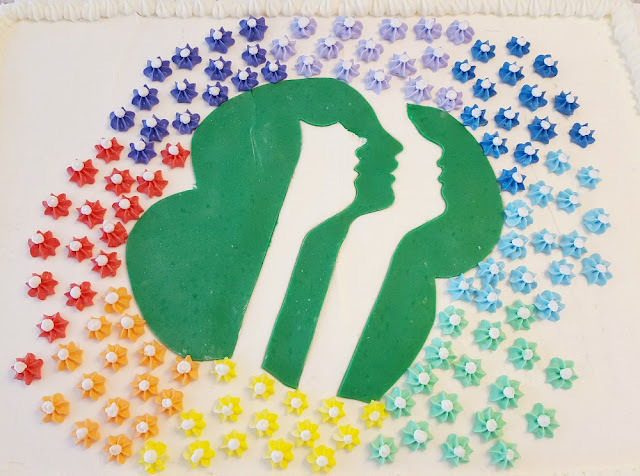 Scroll down to see the easy recipes and learn how to make a Rainbow Cake for a Girl Scout Troop! This 11x15 Girl Scout cake with American buttercream icing is made with ready made green Wilton fondant and a box of white cake mix. The flowers are made with a number 18 star tip with a white dot of icing in the middle of each. Trace the pattern on a piece of paper and trace it out with edible markers, then cut out with kitchen shears. Easy peasy! The icing is a homemade whipped buttercream. The Girl Scout cake is an 11x15 Betty Crocker cake mix, but add 3 eggs, 1 stick melted butter, and 1 cup milk instead of following the box directions. 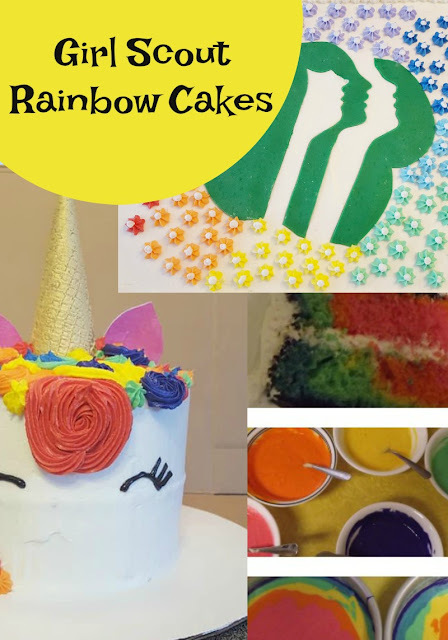 If you want to make your cake batter rainbow colored too, check out this recipe for Rainbow Cake. The Girl Scout Troop will love mixing this one. First, mix up cake batter, you can make a white cake from scratch or use your favorite white cake from a box. Divide the batter evenly between 6 bowls. Add food coloring, stir to combine. Put icing in between the layers, stack, spread icing on the outside. A birthday is the perfect excuse to make a rainbow cake, but who needs an excuse? After reading several different tutorials on how to make a rainbow cake and cupcakes, we got started. First, mix up a box of white cake mix following the package directions, or you can use your favorite homemade cake recipe. Then, involve the Girl Scout Troop. Let them count out the bowls, (you need 1 bowl for each color of the rainbow) mix in the food coloring. Why stop at Rainbow batter and icing, when you can make your cake the shape of a Unicorn? 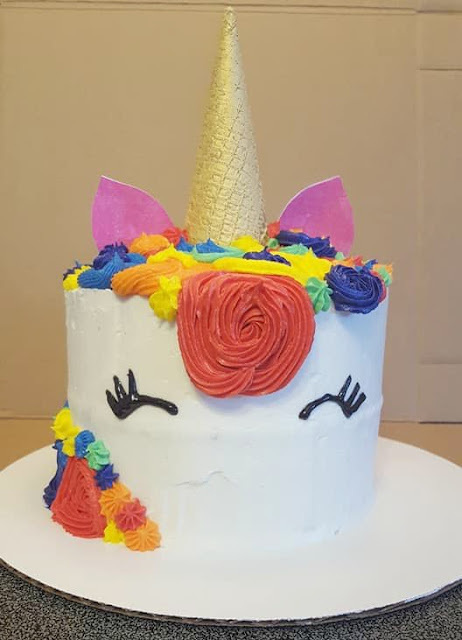 It is easy to make a Rainbow Unicorn Cake too! Use the same cake mix and directions to tweak it as in the Girl Scout Cake above. This time, use 8" round cake pans. Ice with the same whipped buttercream as above. Unicorn horn is an ice cream cone sprayed with Wilton brand gold edible glitter spray. Ears are pink card stock with a toothpick to hold them in place. Flowers are made with different size star tips as mentioned above in the logo cake. For color, use Wilton gel food coloring. Black is Wilton brand gel icing.